In the current political atmosphere of a sporadic fear gripping over India, be it known or unknown these assassinations, killings, murders, lynchings, rapes and caste atrocities through which the virulent proponents of Hindutva, the Sangh Parivar as it is known, has unleashed a mass ideological terror of majoritarian “religiosity”. This affright imposed by clandestinely co-ordinated outfits of Sangh in various ways of moral policing, on eating choices, to dress wearing, to who you choose to be with, makes even the ordinary living to feel like they are breathing dead. This forces one, to involuntarily take sides, with an un-written famous dictum dangling over their heads; “you are with us or against us”. This paralyses all democratic intent to resist the onslaught of reactionary politics of the Sangh Parivar. Dissent, as we have come to understand, is the essence of modern polity, it should act as the conscience keeper which puts pressure and directs the functionaries of democracy to stay on course to do common good without resorting to any suppression or sectarianism. It is not that the previous Govt. of the United Progressive Alliance (UPA) led by Congress at the centre was bathed in honey and milk, and was in any way above board in relation to human rights and was safeguarding human rights defenders. But UPA had a compulsion to at least pretend to cater to the needs of the common people as a whole because historically they were seen as the political establishment in charge that goes by the rules enunciated in the Republican Constitution that independent India agreed to adhere. UPA had mastered the art of delaying, and consequently denying justice. But what has changed since BJP lead NDA coming to power in 2014. It is a fact that under the current regime, every aspect of governance and policy-making has seen a sea change in tempo and attitude. Modi & Co. have thrown out of the window, even the modicum of constitutionality that the previous regime of UPA had. 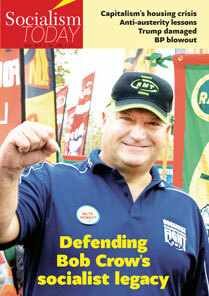 There is not a week in the last three and a half years of this regime, that has not laid bare its divisive politics. Be it the aggres sive neo-liberalism, its chaotic economic shocks such as “demonetisation” or its reactionary Hindutva politics, imposing the rules on what one eats or wears, who one loves or the way one practices his or her religion. What in a democratic state, with seventy years of existence would be taken for granted, everything is increasingly becoming a point of contention, because the Hindutva narrative of India’s democracy is the rule of the brutal majority. It is this majoritarian imposition that Gauri was dissenting, questioning and was trying to facilitate the creation of a varied opposition from different faiths, political entities and even different socially oppressed identities to challenge the unitary narrative of Hindutva fundamentalism. Through her indomitable nature, Gauri posed a threat to the reactionary forces of Hindutva. Meticulously carrying out the duties of a conscientious dissenter, through her writing and political activism, she had taken on many adversaries particularly from the Right political spectrum, who had even got her almost jailed on the charges of defamation, against those personalities who are powerful in the Hindutva circles. While there are many misleading stories being circulated about the origin of her assailants, her politics was unmistakeably pro-people, hence the powers that be who wanted to change the very basic tenets of India’s republican constitution saw her as an impediment. 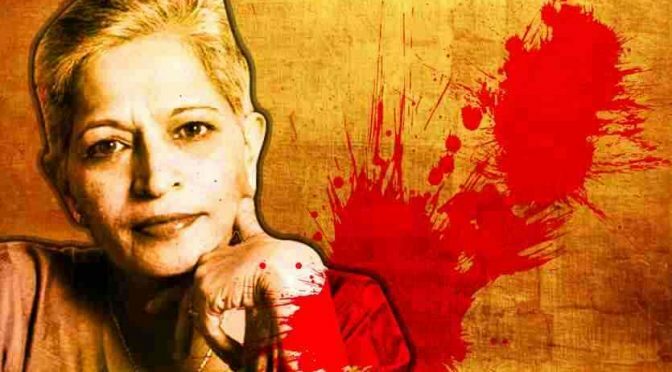 Without a shred of doubt, the assassination of Gauri Lankesh was masterminded by the right-wing ideology that has captured the parliamentary power in this country. Here we need to understand, that the Party such as BJP mentored by RSS, which eulogises Fascist personalities such as Adolf Hitler and Mussolini, has mastered and advanced its understanding of the psychology of the masses. It perfectly understands that to take a classical fascistic road in a landmass like India, which has deep rooted varied cultures, customs and practices is next to impossible. It has also realised that while the world outside has entered 21st Century almost two decades ago, but the vast sections of the populace here still living in 19th century or even earlier. Gauri’s assassination should be viewed in the backdrop of coming Karnataka elections in 2018 and the General elections in 2019, the majoritarian Hindutva forces and its electoral representative BJP, has already tasted power in Karnataka between 2008 to 2013. During their regime, they have infiltrated state’s bureaucracy, police forces and even the judiciary to a great extent. Though it is too early to predict the course that the immediate future will take, it looks like the economic misadventures combined with socially divisive policies of Modi regime is increasingly getting exposed. There is even a murmur of a snap poll in 2018, clearly a year ahead of schedule. The fall in GDP growth rate, the almost stagnant or even disappearing jobs on a mass scale all over the country, one can easily draw the conclusion about the results in such an eventuality. narratives that the Sangh and its chorus ensemble fabricates, has hitherto fooled the burgeoning youth with very many myths, be it the stories on Hindu mythology being authentic and scientific, its narrow nationalist/jingoist take on India’s History and nationalities. high priests. And finally, she called the bluff of the myth of Hindu Majority, by throwing herself in support of the demand of Lingayat community for a separate religious status distancing itself from the brutally casteist Hindu religion which bases itself on Chaaturvarna System ( The theory of four races). great extent the RSS through its manipulations of narratives has appropriated the 12th century revolutionary and reformer Basavanna who valiantly fought against the brutally sectarian Brahminism and its Varnashrama and declared the universality of the human being with no boundaries of caste or class. Basavanna who is hailed has ‘Jagadjyothi'(univeral light) Inculcated a sense of pride in the concept of all labour being a path to salvation, that way dismantling the myth of upper caste Brahmins being the direct custodians of God. It’s no secret, as to how all the historical split-offs from Hindu religion have been forced to submerge their religious identities as being pliant discourses of the same dominant ideology. That way the Sangh has dampened the spirit of inquiry and independent research of history. Through its cacophonous propaganda, it has dubbed all written history being anti-Indian and a conspiracy of the invaders, particularly the Muslim and Christian. In the context of Karnataka, the infant stage rebellion of Lingayat community is an affront to its grand pan-Hindutva schema of things, Gauri Lankesh, being a powerful voice rooted in the soil of Karnataka, convincingly articulating her opposition to RSS scheme of things, was indeed too much to ignore, hence she was brutally assassinated. Prof. Kancha Ilaiah, who is currently the eye of the storm, rightly pointed in his writing on Gauri soon after she was assassinated, said “ The newly-kindled Lingayat religious movement is a big worry for BJP state chief B.S. Yeddyurappa (and former Chief Minister of BJP), as he is a Lingayat. As Kancha Ilaiah opines, even M.M. Kalburgi was killed not just from the same gun as the police investigation has found out, but like Gauri Prof. Kalburgi too, through his scholarly research writings asserted how the Lingayat religion being a rebellious and separate religion. Sangh Parivar and its ideology of hatred, which feeds and breeds on the social and political backwardness prevalent in the society is the manifestation of the failure of the bourgeoisie to solve the fundamental questions of poverty, landlessness and casteism. The feudalism which should have been ruthlessly fought and eradicated long ago is today more entrenched, because the capitalist ruling class failed in its fundamental task of developing society and lifting it out from the depths of feudal morass. Only a united challenge can take forward the legacy that Gauri has bequeathed to all of us, to take forward the struggle to see that the principles of genuine democracy, equality and brotherhood becomes a reality. Which by the way is not something that can be ensured by a mere regime change, from BJP to Congress, but can only be achieved by SYSTEM change, nothing short of overthrowing Capitalism, which lives and breeds on Casteism can guarantee it.